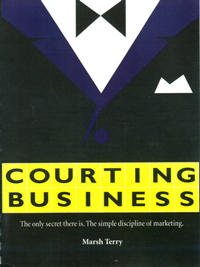 Marsh Terry is the author of Courting Business, a workbook of 52 weekly lessons and exercises designed to improve readers' strategies on marketing their business. Terry says of the book: "It is elegant in its simplicity and is guaranteed to increase business in exactly the same way that commitment and diligence in getting physical exercise guarantees increased strength, better health, and well being." A copy of the book is available in the local authors book collection of the Bainbridge Public Library.